I asked Tess in her episode about her go-to dinner party dish and she divulged that whilst she isn't a huge pudding person, when she throws a Summer BBQ she likes to serve her guests chargrilled pineapples cooked on the BBQ served with cooling coconut ice cream for pudding. This sounds like a wonderfully Summery and light pud that I needed to try it out and experiment with. I like puddings that even work for people who don't love puddings, and I feel like this fits that bill. It's refreshing and fruity and best of all, wonderfully simple to throw together! Whenever thinking about a new dish there are several important things to think about. You want to think about the balance of flavours, the different textures, the colours and the overall look of the dish. As a chef these are the things I consider every time I come up with a new dish and a little forethought makes a big difference. I absolutely love the contrast between the hot chilli pineapple charred from the griddle and the cooling creamy coconut ice cream. Pineapple and coconut is a dreamy tropical combination, which, once you taste it will make you almost believe you can feel the sand between your toes...almost. I like marinating the pineapple in just brown sugar and then making a sort of sticky chilli syrup to douse over it once it's cooked. The bursts of freshness and colour from the pomegranate seeds are, in my own modest opinion, a great addition. I am a big fan of coconut milk ice cream and it's so easy to make, You don't need to faff around with making a custard base as you would with a traditional ice cream and you can easily make it without an ice cream maker. I like to throw in a slug of rum which works particularly well with this dish, although of course if you've got children clamouring to get their hands on some, or you don't drink booze, then by all means leave it out. As the cold weather is well and truly upon us here in London, I like the idea of making a dish that can transport you, even if it's just through food, to warmer tropical climes. Aloha. For the coconut ice cream: Simply pop all the ingredients into a blender and blend until smooth and creamy. Leave to chill in the freezer overnight or for at least 6 hours. Ideally take it out of the freezer every 30 minutes for the first few hours and give it a little whisk. This will help to reduce ice crystals. Alternatively, if you have an ice cream maker simply follow the manufacturers instructions. Just make sure you remove from the freezer about 20 minutes before you want to serve it. Otherwise you will need an ice pick and a hammer. For the pineapple, in a small bowl, combine the honey and lime juice. Brush this glaze like mixture onto the pineapple chunks. Cook on the BBQ or a griddle pan works just as well. Grill for about 3 minutes each side, turning them so that each side gets the lovely griddle marks and the charred flavour. To make the syrup heat the soft brown sugar with the rum (or water) and the red chilli. Gently bubble away until sticky and delicious. Add the fresh mint right at the end after you've turned the heat off. 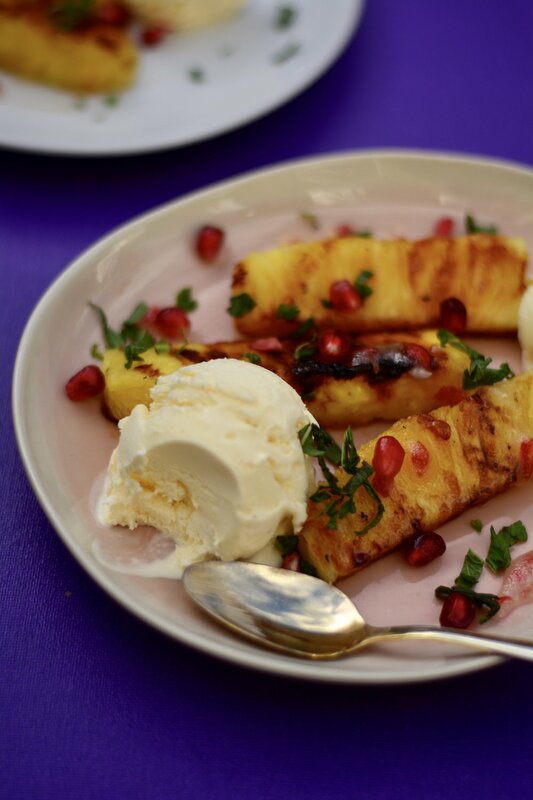 Serve the hot pineapple chunks with a drizzle of chilli syrup and a scoop of coconut ice cream. And a scattering of pomegranate seeds. Dreamy.